To find out why people have died, today’s medical examiners perform autopsies (AW-top-seez). They cut open the body and study its parts. 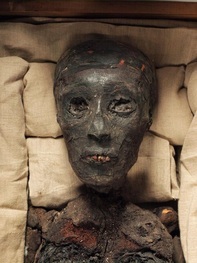 Ancient Egyptians also performed autopsies to help understand causes of death. In addition, autopsies helped ancient Egyptians study the human body. By comparing the hearts of people who were different ages, for example, Egyptians could determine what a young, healthy heart was supposed to look like. The Egyptians not only studied the human body, but they also kept detailed records of what they discovered. They wrote and drew their observations on papyrus, a form of paper. The papyrus records became the medical textbooks of that time. 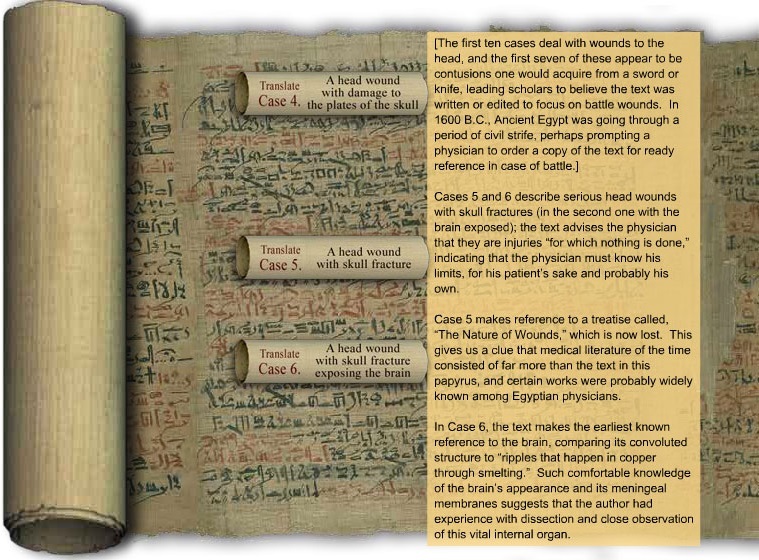 Their observations allowed Egyptian doctors to share their knowledge, including how to treat various diseases. In 1862, an American named Edwin Smith purchased a medical papyrus in Luxor, Egypt. Smith was not a medical expert, but he knew a lot about old documents. He knew that what he had found was valuable. 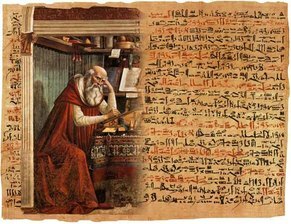 The papyrus turned out to be an ancient textbook on surgery. 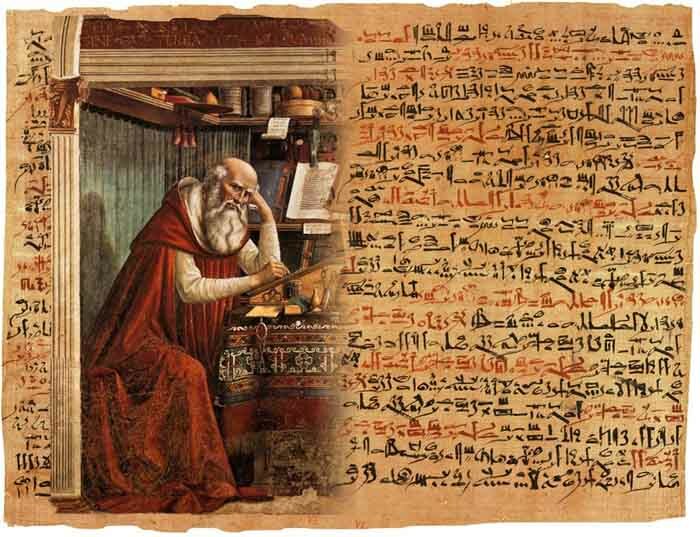 The papyrus was probably written around 1600 BC, but it was based on information from a thousand years before that. 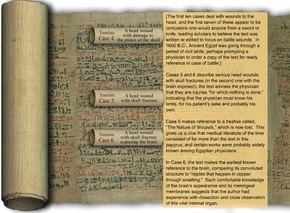 The papyrus presents the information as case studies, including an analysis of how patients survived or died. ​Howard Carter, an English archaeologist, stood facing the sealed inner door to a royal tomb in Egypt’s Valley of the Kings. It was November 26, 1922. With him was a rich English lord who was paying for Carter’s work. They knew it was the tomb of Tutankhamun because there was an impression of his royal seal on the door, but they wondered whether the king’s mummy and the many things buried with him for his afterlife would still be inside. Many of the tombs that had been discovered in the valley had been completely looted in ancient times by thieves looking for gold, gemstones, and costly perfumes. Carter cut an opening in the door and put a lighted candle through the hole. He was astonished by what he saw! Inside the room there was the glitter of gold and a profusion of objects heaped together in great piles. Carter had first become interested in ancient Egypt when he was a boy. 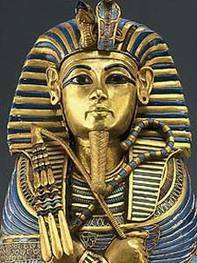 Convinced that Tutankhamun was buried somewhere in the valley, he had persisted in his search for the tomb for five years. It had been slow and tedious work. Year after year, Carter and his helpers had dug pits and ditches and cleared away tons of rocks and soil. At last, his efforts and the endless excavating had paid off. The next day, the men entered the first of the four treasure-filled rooms they would find in the tomb. There were hundreds of objects crowded tightly together. Among these was a golden throne on which Tutankhamun must have sat when he reigned over Egypt—more than 3,000 years before. In an adjacent room there were even more riches. Carter soon realized that weeks of hard work lay ahead. Everything in the first room had to be photographed, recorded, and removed before they could examine the rest of the tomb. ​It took Carter many years to remove and pack every object found in the tomb. Most of these treasures are now in a museum in Cairo, Egypt. Tutankhamun still lies in his tomb in the Valley of the Kings. ​A young Egyptian king dies when he is just 19, and he is buried in a hurry. His name is Tutankhamen, or Tut, and thousands of years later, an archaeologist discovers his tomb. The archaeological team begins to study everything in the tomb, including the king’s mummy. The world is fascinated by the riches of Tut’s tomb, but how the young king died remains a mystery. In 1968, a group of scientists Xlog-rayed the mummy and found what appears to be damage to the skull. “Could his death have been caused by a blow to the head?” they wondered. Theories started to emerge. Perhaps the king’s young wife killed him, or maybe someone envied the king’s power. In 2005, scientists examined Tut’s mummy once again, using a CT scanner—a special kind of X-ray machine. After scanning the mummy, scientists determined that the archaeological team that originally discovered Tut had not been careful enough. They had dislodged some small bones when they removed Tut’s gold mask. Now scientists believe that there was no blow to Tut’s head, at least not while he was alive. Instead, they believe he died from an infection resulting from a broken bone in his left leg. It is also possible that he died from another disease. The mystery of Tut’s death has not yet been solved, but murder is an unlikely explanation. The yo-yo is one of the world’s oldest toys. No one is sure when or where it originated, but it is known that there were yo-yos in ancient Greece about 2,500 years ago. Among the artifacts in the National Museum of Athens, Greece, visitors can see a vase, from about 500 B.C. that shows a young boy with a yo-yo. Some of these ancient Greek yo-yos were decorated on their two halves with pictures of Greek gods. In the late 1700s, the yo-yo made its way to England and France. At that time, a French artist painted a portrait of the young son of King Louis XVI holding his l’emigrette, as the toy was called in France. In England, the yo-yo was known as a quiz, a Bangalore, and a Prince of Wales’ toy. Flores immigrated to the United States and took a job in California as a hotel bellhop. On his lunch breaks, he played with a yo-yo that he had carved. Often, crowds would congregate to watch him do tricks with his toy. Flores wanted to do well in his new country and aspired to work for himself. Making and selling yo-yos, he realized, might make this dream come true. In 1928, he started the Flores Yo-Yo Company. To increase sales, he helped yo-yo novices learn to do tricks and held spinning contests for yo-yo experts. The contest winners were those who could keep their yo-yos spinning for the longest duration. In 1930, Donald F. Duncan, a smart businessman, bought the Flores Yo-Yo Company and acquired the rights to the name “yo-yo. “Over the years, Duncan and other manufacturers have added new features that have helped to make the yo-yo one of the world’s most popular toys. The yo-yo traveled to one more new destination in 1987.It was taken into space on the Space Shuttle Discovery as part onia’s Toys in Space project. There, the yo-yo was used in experiments on how toys behave in a weightless environment. It seems quite amazing that this ancient toy has endured long enough to have been played with in space. When people go to the movies today, they can settle in to watch and listen to a story, but what if when the lights dimmed and the movie began, there was no dialogue, sound effects, or music? That’s what the first movies were like. Those silent films are important to film history. When movie theaters showed silent films, a musician was often there to play live music along with the movie. Music was chosen to fit the mood of the movie. Occasionally, musicians or theater staff also produced sound effects, such as tires screeching or doors slamming. However, there was no sound in the movie itself. Instead, the story was told through the actors’ gestures and through words shown on the screen. When movies first included sound, audiences weren’t sure what to think. Not everyone was excited about the new type of film, which became known as the “talkie.” Many silent film performers had trouble with the new format. 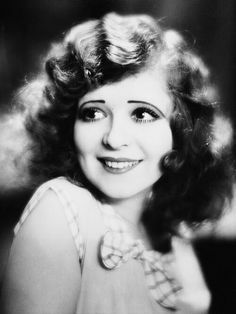 Clara Bow, who was a renowned silent-movie actress in the early 1920s, was too nervous about her voice to become a star in the world of talking pictures. She faded from the spotlight and left show business altogether. The first movie with sound, The Jazz Singer, was released in 1927. It marked the beginning of a new era, although silent movies continued to be released for two more years. Talking pictures became a huge success, and Hollywood abandoned silent films. On an evening in 1918, a 10,000-pound elephant named Jennie was led into a cabinet on the stage of the Hippodrome, a theater in New York City. 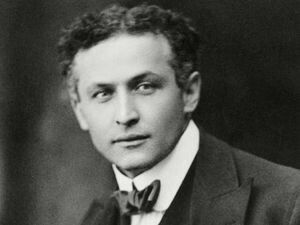 Harry Houdini, the world-famous magician, closed the cabinet’s curtain. Several seconds later, he whipped open the curtain. Jennie had vanished! The theater resounded with the audiences ‘cheers and applause. Houdini’s real name was Ehrich Weiss. He was born in Hungary but moved to America with his family when he was quite young. To help pay family bills, he shined shoes and delivered newspapers. When he was 14, Weiss took a job cutting fabric for neckties. At night, he read books on magic and practiced tricks. A few years later, he quit this job to pursue his dream of becoming a magician. It was then that he changed his name to Harry Houdini, in honor of his hero Robert-Houdin, a renowned French magician. Although he performed wherever and whenever he could, Houdini was not an instant success. In 1899, his luck changed when he made escaping from handcuffs a featured part of his show. He extricated himself from handcuffs fastened in front or back, from leg irons, and even from thick chains that locked his wrists to his ankles. Houdini, now billed as the Handcuff King, was becoming a star. Houdini was always looking for new ways to astound his audiences. In 1908, he introduced a feature called The Water Can into his act. 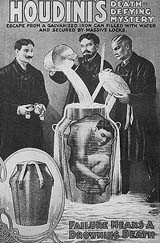 For this trick, he was handcuffed and squeezed into a large metal milk can that was filled to the top with water. The lid was fastened with locks and then a screen was placed in front of the can. To dramatize the danger, an assistant stood by with a fire axe, ready to smash open the can. The minutes ticked by on a large stage clock, increasing the audiences’ nervousness. At last, a breathless and dripping Houdini emerged from behind the screen. The milk can, it was revealed, was still intact and locked. To prepare for this stunt, Houdini had submerged himself in his large bathtub at home and practiced holding his breath for increasingly long periods of time. What were the secrets of Houdini’s magic? Many of them will never be known. What we do know is that he had an extremely strong and agile body, a fearless spirit, and an unending drive to succeed. It was these assets and years of hard work that helped to make Houdini the greatest magician and escape artist of his time. 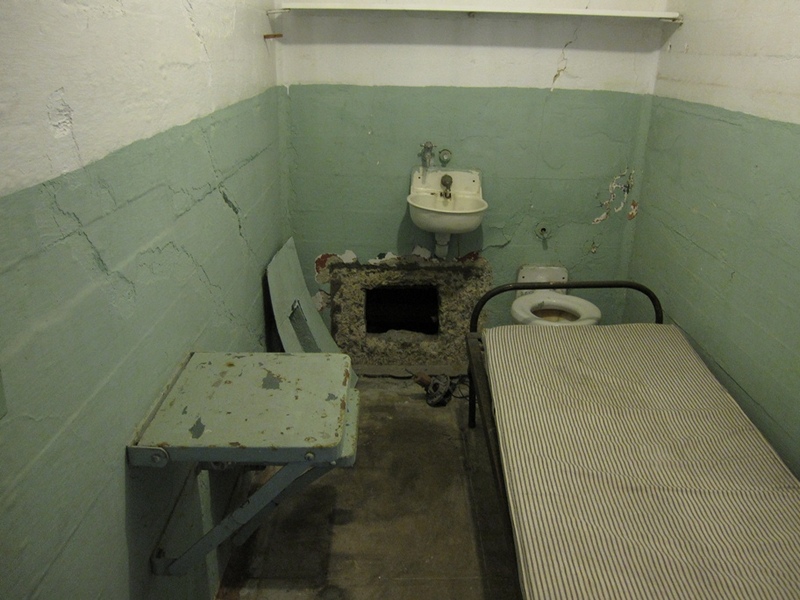 Alcatraz Island was once home to many of America’s toughest, most infamous criminals, including Al Capone and Robert “Birdman of Alcatraz” Stroud. 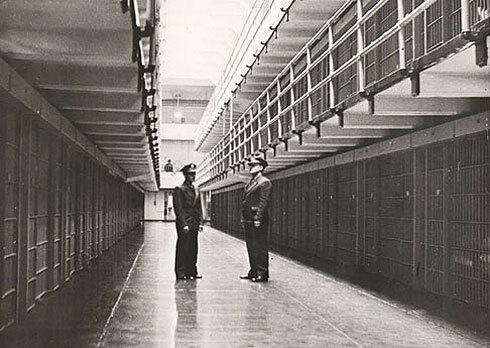 Alcatraz was an island prison where no inmate ever successfully escaped, a chunk of land so remote and barren that it earned the nickname “The Rock.” However, not all residents of Alcatraz Island arrived in handcuffs. When Spanish explorers discovered the island in 1775, they called it La Isla de los Alcatraces, or “Island of the Pelicans.” Pelicans weren’t the only birds living on the island, but the name Alcatraz stuck. Humans inhabited Alcatraz for the next two hundred years. This island was home to a lighthouse, a military fort, and, later, the maximum-security prison that made it famous. It was nearly impossible to escape from this jail located in the middle of San Francisco Bay. In 1963, the prison was closed, but in 1973, Alcatraz became part of the Golden Gate National Recreation Area. Snowy egrets and black-crowned night herons are among the birds that make their homes on the island today. These birds, and small animals such as deer mice and salamanders, live where soldiers and prisoners once watched waves crash against the shore. While much of Alcatraz’s fame comes from its history as a place of guards and locked cells, another part of the story comes from the island’s wild, natural splendor. 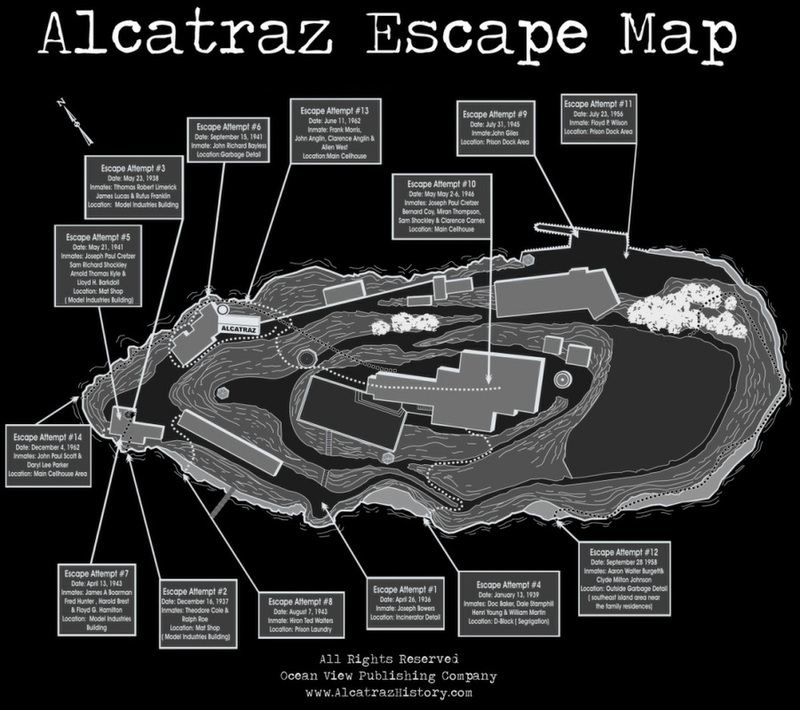 Scholastic Scope "Escape from Alcatraz"